Today, December 18th, members of the Envirothon team constructed an Inukshuk in support of the Dryden Olympic Committee Celebration plans. 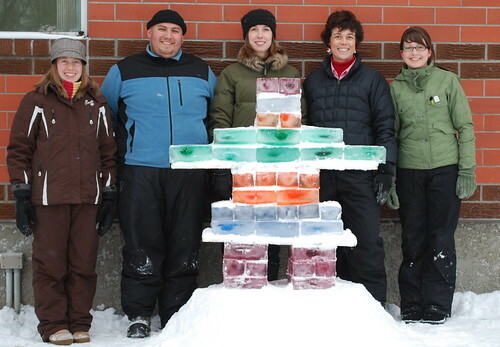 The blocks of ice were created by freezing water in old diaper wipe containers and food colouring was added (Olympic colours: blue, red, yellow and green). DHS students are invited to the Government Dock Saturday, December 19th at 9:00 am to help build more torch relay Inukshuks.